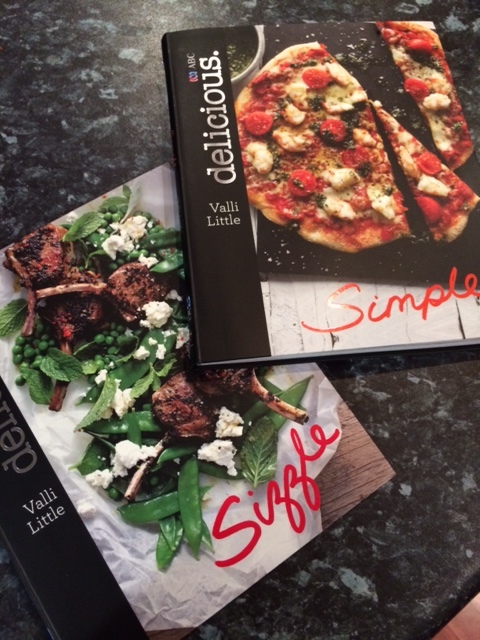 Bake, Sizzle and Simple are three new bite-sized cookbooks from Valli Little and the team behind Australian food magazine, delicious. I have Sizzle and Simplefrom the collection, and can guarantee I’ll also be checking out Bake in the near future. While these cookbooks might be small, they each contain sixty recipes – all of them simple and achievable even for those who aren’t so awesome in the kitchen. The layout is clear, with one recipe and the corresponding colour photo across each double page spread. The gorgeous photos alone are enough to get you cooking. Simple is just as the title portrays. Simple, fast recipes that rely on pantry staples such as pasta, rice or couscous and match them with fresh ingredients. See? Simple. There’s twists on the old standards like Spaghetti and Mussels, Homestyle Meatloaf and Singapore Noodles. Then there’s the Macadamia Crumbed Chicken Strips with salsa, Prawn, Chilli and Pesto Pizza and the Lamb and Haloumi Sausage Rolls. Like Sizzle, Simple also has a small number of vegetarian dishes. Bake, Sizzle and Simple join Spice, Indulge and Slow in this series of mini-books. You’ll find loads of inspiration between the pages, and their small size makes them easy to store in an easy-to-access kitchen cupboard or shelf.